A-Frame signs are an ideal way for you to promote your business. We have a comprehensive range of point of sale signage, which includes A-Frames, Sandwich Boards, Swinging Signs, Poster Displays and Pavement Signs. Promoting your business is essential. A-Frames and pavement signs are the perfect solution to ensure your messages and promotions are noticed by your potential customers. They come in a number of different sizes. They are so popular because they can be made with a number of different colour frames and can have different finishes to give your signage the edge over the competition, and to make your sign more appealing. They play such an important role and it is essential that they look good, be user friendly and represent good value. Our range of Point of sale solutions tick all of the boxes and are the perfect tools to display any offers & incentives and is an easy and effective way to attract consumers to your store. Our Site Board solutions include Site Boards, Builders Signs, Site Safety Signs, Advertising Hoarding's, Scaffolding Signs and Banners and scaffold frame sign inserts. Our standard Site Board size is 610mm x 610mm, but we can make them any required size, dependant on your circumstances and requirements. Site Boards can be made from foamex or corrugated plastic. For larger boards and other signs we would recommend using Dibond, which is an aluminium composite board. Our site Boards are designed to provide effective and professional promotion of both individual practices and practitioners. They provide one of the easiest and indeed the cheapest methods of promoting your services, to your potential clients. 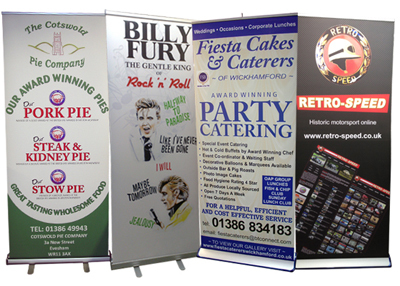 Roller banners are an in-expensive, portable and effective form of advertising. Also known as pull up banners, roll up banners, retractable banner stands and banner displays they are an ideal solution for trade show banners, exhibition displays and event branding or can be used as a long term display in reception areas, foyers and shop fronts. All our roller banners are printed in-house on our own Printers. Roller banner stands are probably the simplest form of large format advertising. It is basically a banner that pulls out and rolls back into a cassette/stand. They are small, easy to carry and quick to erect, a great professional tool for filling a backdrop quickly and cheaply with company branding or promotions. If you are struggling with artwork for any of our Point of Sale solutions, or would like to know the sizes, specifications or formats the artwork should be supplied in, Contact Us and our team will be happy to answer all your questions.